The Kentucky Wildcats continue to reign as one of college basketball's premmier programs. They've earned eight national titles (1948, 1949, 1951, 1958, 1978, 1996, 1998 and 2012), 15 Final Four appearances and 47 conference championships. 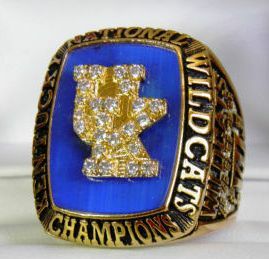 Kentucky Wildcats championship rings on eBay that have sold recently have been fairly high dollar replicas and are only from the 1998 championship, although you can expect to see the 2012 model shortly, if it's not available already (click the links to eBay below to see what's currently up for bid). During the 42 years that Adolph Rupp was the head coach of the Wildcats (1930-1972), Kentucky brought home 4 national championships. The team went 32-2 in 1949, just after winning their first national title in 1948. The 1949 team was marred though by the points shaving scandal, in which players were bribed to shave points from an NIT game with Loyola. The team went on to win the national championship that year, but will always be remembered by the scandal. Rupp’s Wildcats won their next two championships under his guidance as well. In 1951, Kentucky defeated Kansas State 68-58 for their third Wildcats championship ring. In 1958 they went 23-6 for the season and went on to defeat Seattle 84-72 for their fourth national championship. In 1978, under coach Joe B. Hall, the Wildcats posted a 30-2 record and they defeated the Duke Blue Devils 94-88 for their fifth championship and first in 20 years. In 1996, under another legendary coach, Rick Pitino, Kentucky posted a 34-2 record and earned a reputation for their full-court pressure defense. The Wildcats eventually faced Syracuse in the national championship game, beating them 76-67. The 1998 Wildcats under the leadership of coach Tubby Smith posted a 35-4 record and entered the NCAA tournament as a #2 seed. They ended up facing Utah and defeating them in the championship game, 78-69. In 2012, the 'Cats were young but deeply talented and cruised through the season and into the title game against Kansas where they won convincingly. Replicas of Kentucky championship rings have sold on eBay lately between $101 and $150. They are brass and plated with 18K yellow gold, containing authentic CZ’s that are handset. If you're a true 'Cat fan, you might also see the occasional Kentucky bowl game or football championship ring too. 1998 KENTUCKY WILDCATS BASKETBALL NCAA CHAMPIONSHIP SALESMAN RING 10K GOLD COA!